I like forests. There is something about them, that makes them interesting to me. A sense of nobility and mystery. 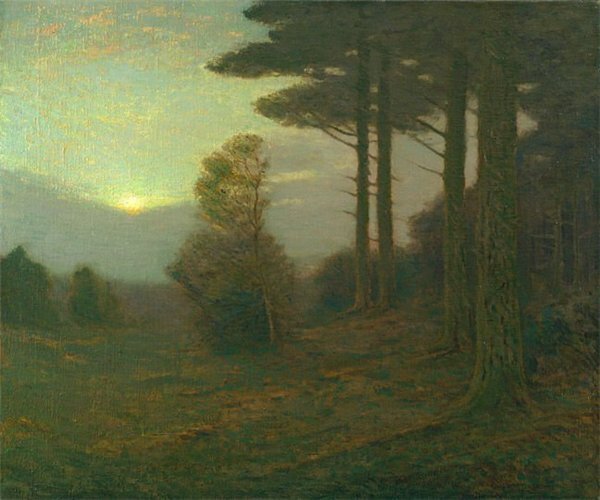 I have always wanted to take these feelings, and express them in a good forest painting. This has proven to be very challenging. There is an abundance of detail, all of which must be absorbed and filtered. Forests also involve painting more up-close and intimate detail. I tend to prefer painting the far-away. 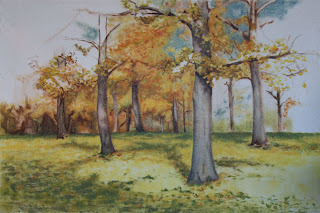 This season, I have focused on painting the forest. This picture was done on location at Blandy Farm, up in northern Virginia. 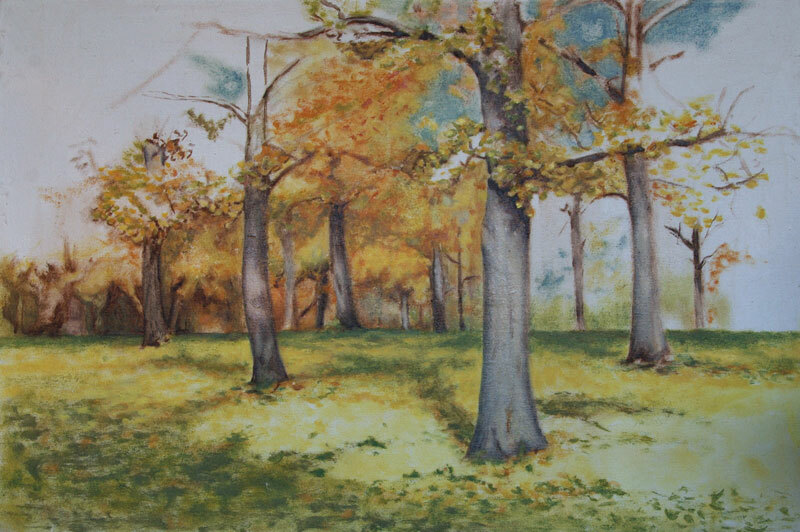 It is of a special grove of ginkgo trees. I made the journey at just the right time to capture them as they turned in unison. The trip up to the farm, as well as my stay, were marked by misadventures and bad luck. This culminated in the picture itself falling out of my car. The canvas received some damage, and at that point I decided to call it quits. 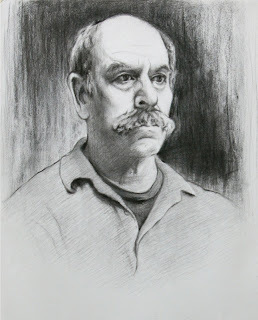 I have neglected portraiture a bit over the past few years. 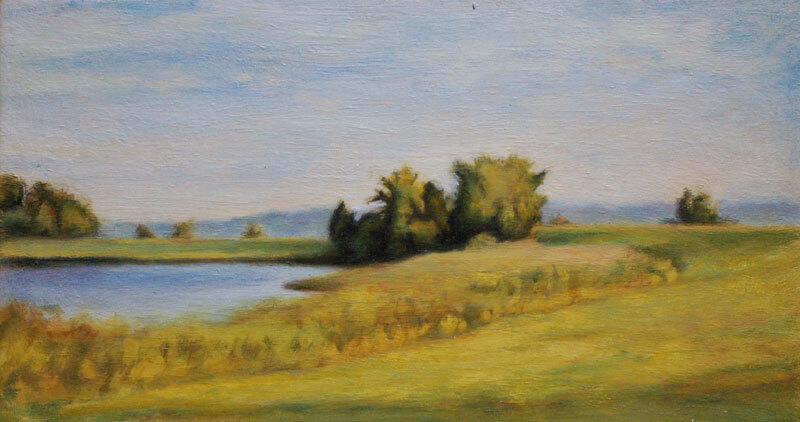 Figuring out landscape painting, among other things, has consumed the bulk of my attention. So recently, I have set aside some studio time, to bring in new sitters. Since I'm still a bit rusty, I'm going to avoid painting anyone for awhile. Charcoal is more forgiving. At some point I will consider hiring some strangers to sit, but for the time being, the "victims" will be friends and family. 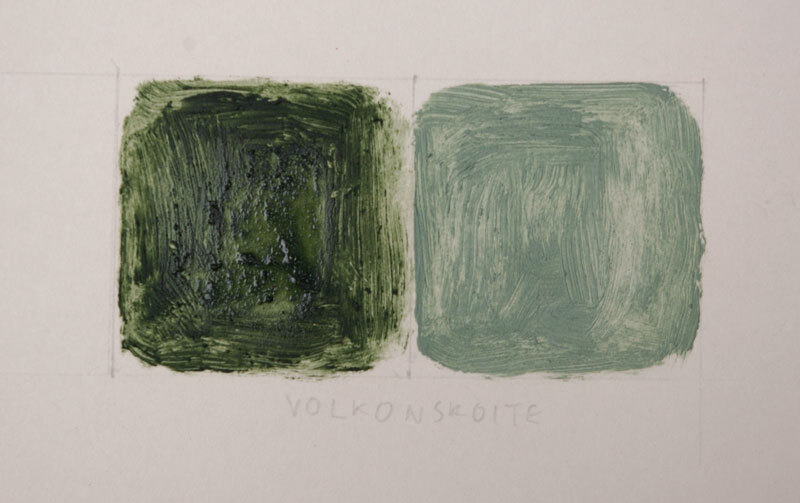 Volkonskoite is rare green earth mineral, found mainly in the mountains of Russia. Named after a Russian prince who was a government minister, its use was confined historically to religious icon paintings. Volkonskoite is not well known outside of Russia, the most famous exception being Picasso. He was known to have imported large quantities from the Soviet Union for use in his paintings. 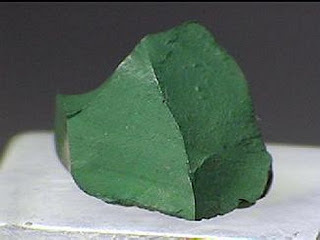 The green color derives from chromium-oxide, also used in a modern equivalent by the same name. The natural variety green is more subtle, and not as "loud" when used in mixtures. It also is far more transparent. Up until this point, I haven't made much use of a standalone green in my pictures. I am always open to the idea if I could find one that was suitably flexible. 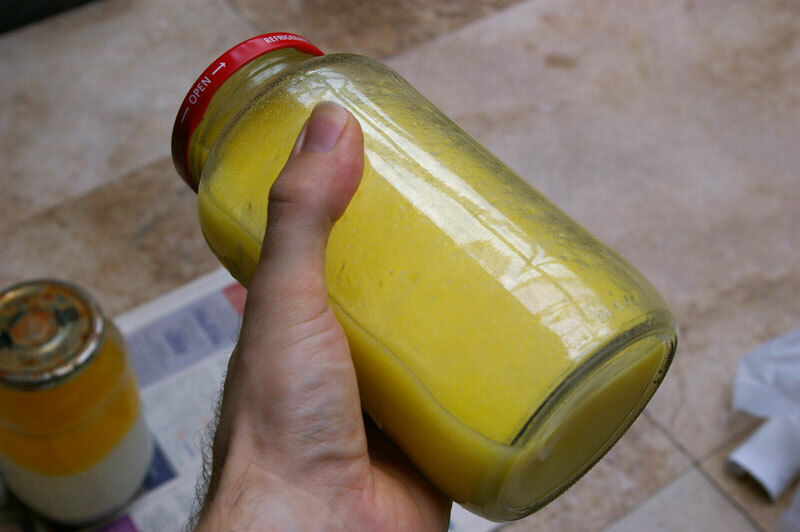 To that end, I've purchased a small jar of the relatively expensive Volkonskoite, to try out. To the left is the raw color mixed with oil, to the right it has been tinted with white. 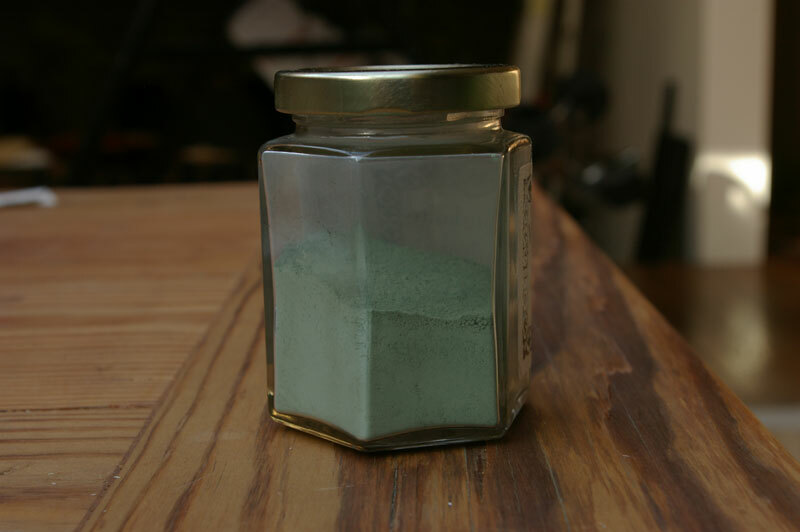 It is a blueish green with cool undertones. I did not find Volkonskoite as weak as some of the green earths I have tried in the past. Using the best oil possible is key not only to making paint with the best handling qualities, but also ensuring that a painting ages gracefully. While linseed oil naturally yellows a certain extent over time, an inferior oil will be far worse. 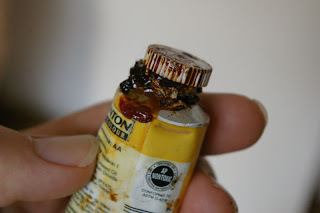 In the picture above, the unsightly brown goo is nothing more than linseed oil that has separated from the paint and oozed out of the tube. 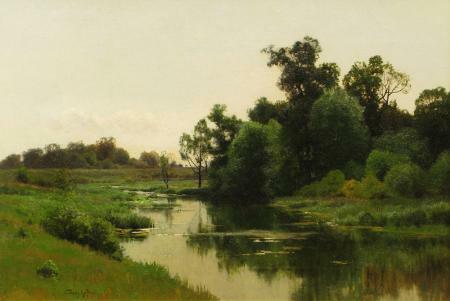 What is surprising is how awfully brown this modern oil has become. 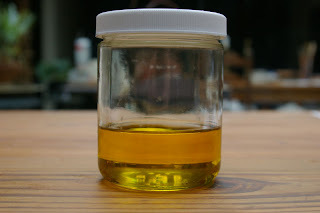 Over the past month, I have set aside some time to improve my homemade linseed oil. My goal was to speed up and improve the process of refining the raw oil. 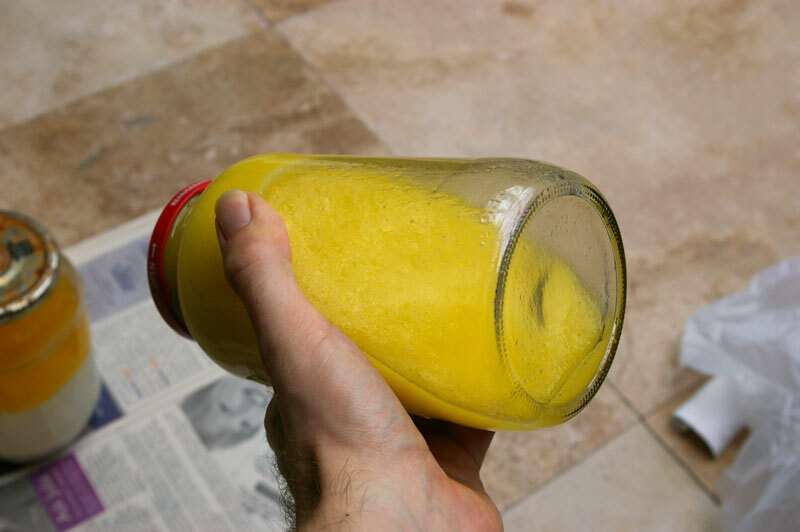 The key to speeding up the process was finding a more effective method of removing the heavy fatty acids, or mucilage contained in the raw, unfiltered oil. These impurities are the key cause of unsightly yellowing seen in oil. I wanted to filter the oil mechanically, without the resorting to the strong chemicals used in the production of commercial oil. In the past I have cleaned my oil with water and sunlight, this method was time-consuming and had to be done in warm weather. 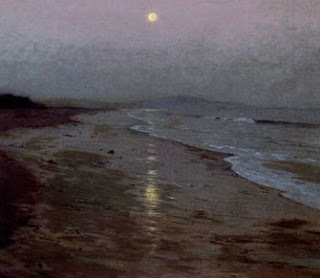 Other historical practices suggested washing the oil with a mixture of sand, salt and water. This was also time consuming and repetitious. A variation of this method substitutes sand for a mixture of diatomaceous earth and cristobalite. These are simple forms of silica, used as a harmless filter medium. The calcined form is easy to find unadulterated, as used in pool filters. 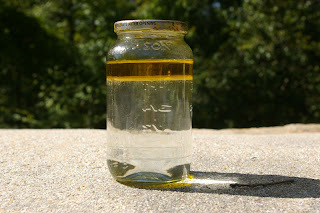 The process is new to me, other artists such as Tad Spurgeon have been making their oil using this method for some time. I mixed one part D.E. with two parts raw flax oil, added a pinch of salt and three parts water. 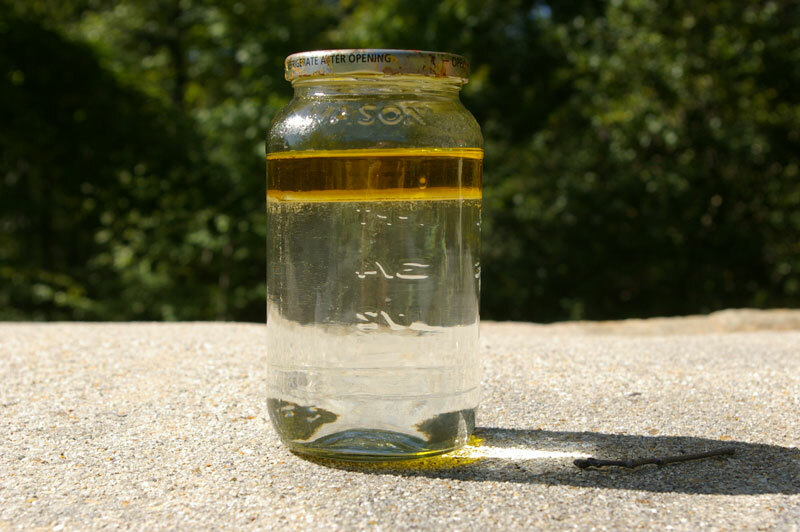 The jars containing the oil were put in a warm spot and shaken periodically over the course of a few days, to disburse the mixture. The early results were dramatic. Most of the filter mix has settled to the bottom of the jar. The heavy fatty acids have become trapped in the boundary layer between water and oil. 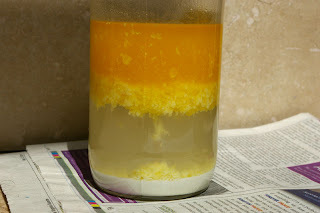 The oil was siphoned off the top, filtered and the process was repeated again several times with fresh ingredients. Salt was used only in the first cleaning. Not being completely satisfied the oil was good enough, I put the oil on the roof and washed it a few times over several days with water. 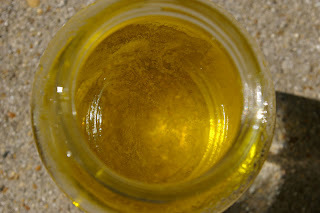 Looking down through the jar shows an almost clear oil, very little mucilage remains. The appearance of the oil has definitely changed. 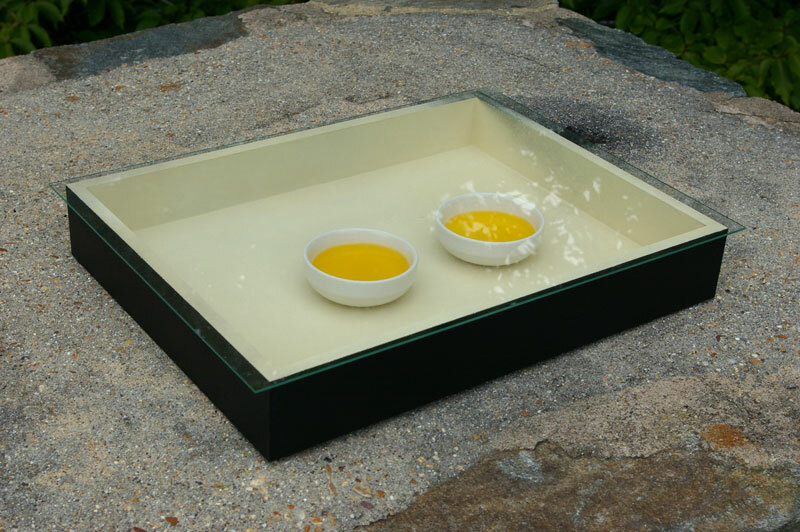 The oil was put into a newly-built glass box on the roof, to briefly sun-bleach. 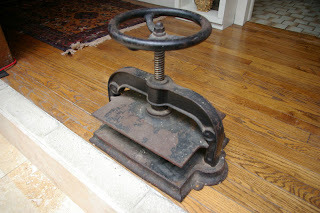 It will then be set aside for awhile to age, before being put to use. I had a chance to revisit my first color woodblock print the other day. After some more trimming of the four separate color blocks, I went ahead and made a new proof. On the earliest proofs, I had issues with the ink, transferring weakly to the paper. This proof incorporates some very helpful hints and tips given to me since I started experimenting with printmaking. By repeating the application of ink for each layer, I was able to get deeper colors as well as black. To get a solid-bodied black took a lot of applications, which did result in some lost detail from that block. I am still in the process of working out the arrangement of colors that best suit this picture. Fall has arrived, and the local college has begun offering live model sessions again. I try to attend these as often as possible, even though most of my recent work doesn't involve people. 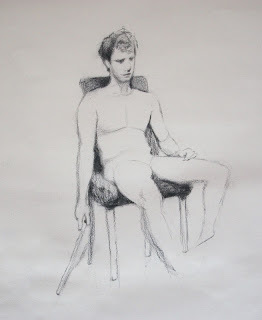 Sketching the figure is a great way to loosen up, and keeps my figurative skills from getting stale. I'm still feeling the effects of the recent hurricane that swept up the US east coast. The storm came very close to where I live, and I lost electricity for about a week. The night before the storm hit, the first bands started passing over us, but there wasn't much in the way of severe weather or rain. 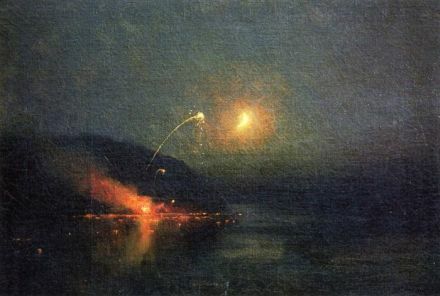 There were a lot of interesting things going on in the sky, so I decided to go out and do an oil sketch. I did this picture very quickly, on some scrap gessoed board. 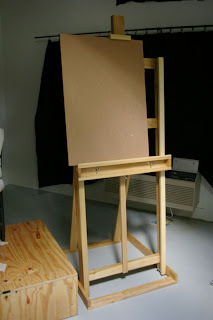 The paint did not adhere well to the raw gesso, but I was able to get something down. The thing I love about storms are the dramatic clouds. The kind of tropical weather that makes for an interesting sky is not easy to capture, everything moves too quickly. 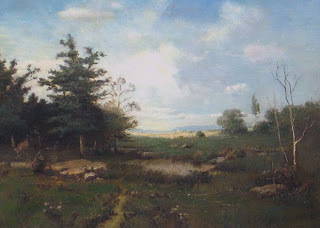 The challenge of this oil sketch, was to compose something in real time, on canvas, that would work. Onset by record-setting high temperatures, I've stayed mostly inside over the past few weeks. This was a good opportunity to try my hand at more printmaking. For the next project, I wanted to make relief prints. This technique has always appealed to me for its simplicity and directness. 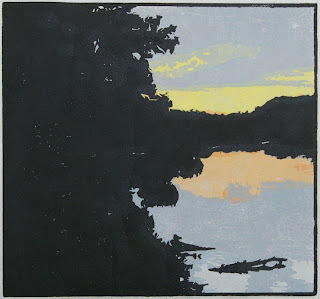 Having seen a demonstration of color block printing, I wanted to try that method first. I purchased a basic set or carving tools back in the fall, so I already had most of what I needed on hand to get started. 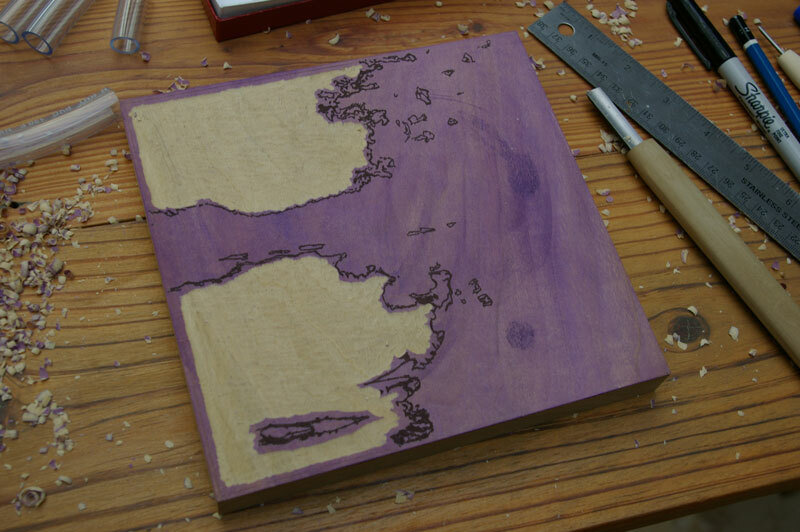 For this picture, I decided to make the print as a woodcut. The design I chose was in keeping with my usual subject material. 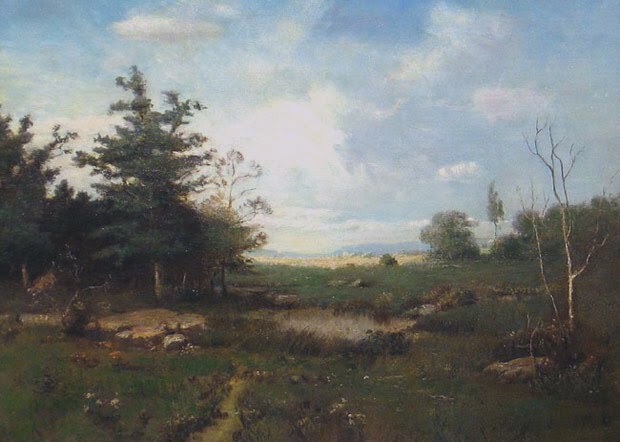 The scene was a view of a marsh off of a bridge, so it wasn't practical to paint on location. I simplified the picture into masses of only four colors, and began to draw out the design. 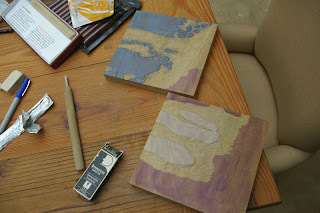 With this style of printmaking, separate blocks need to be carved for each layer of color. I would need to carve four blocks in total. The first plate I carved was my black, or "key" plate. This is the basic design, minus the color. It will be printed last. The purple areas, are from wood that has been stained with some pen ink. This allows me to better see the areas that I have carved. 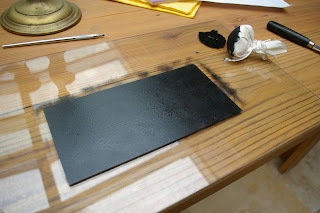 The finished key block, already covered in black ink. I'm going to test print (proof) this print to see how it looks. And the result. The final image is always a reverse of the block. 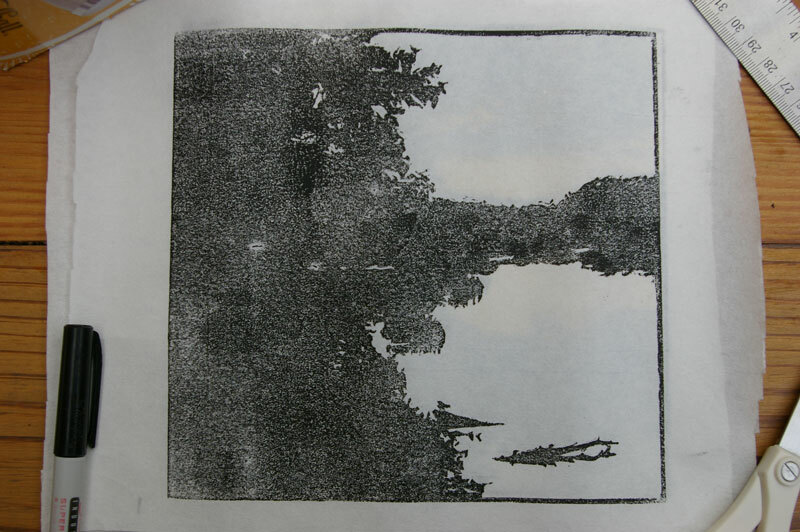 This was printed on light Japanese paper. The next block is a complex layer of clouds and water reflections, colored a deep blue. 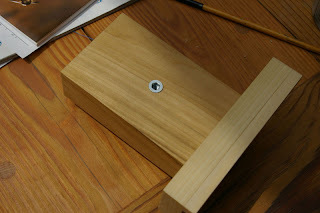 The wood block was overlaid with a clear piece of plastic containing the design. 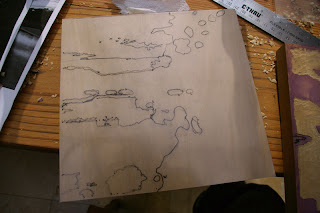 I will trace the outline as best I can onto the wood before I carve this layer. The finished blue plate is pictured, along with another plate meant to be part of the sky. Both plates are inked and ready to proof. This proof shows the three plates combined together. I will still need to finish and proof one more plate, get some better paper, and work on my technique. Right now the prints are too splotchy. Once these issues have been worked out, I can think about doing a run of final prints. Over the past year I have had a growing interest in printmaking. There are a lot of different methods of printmaking, so I wasn't sure what would be best suited to my style. 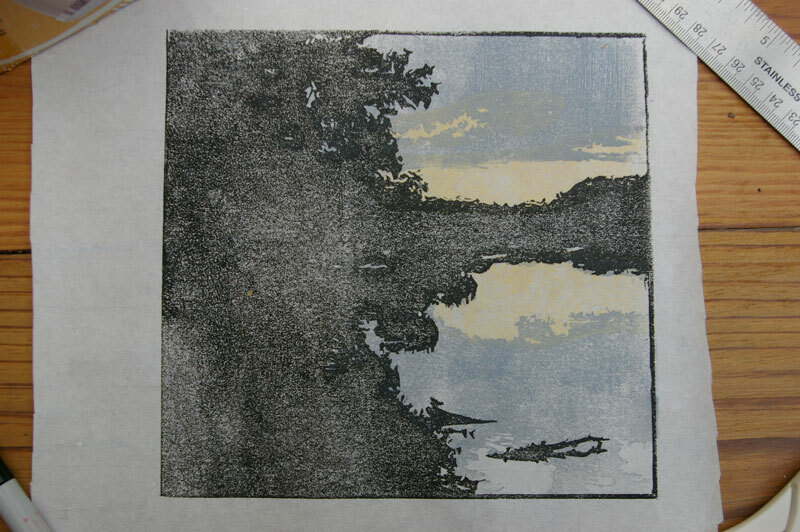 The most common form of printmaking practiced by artists has been some form of intaglio, such as etching or engraving. These techniques are for the most part an extension of drawing that play into the strengths of well-trained artists. Drypoint, is such a technique. 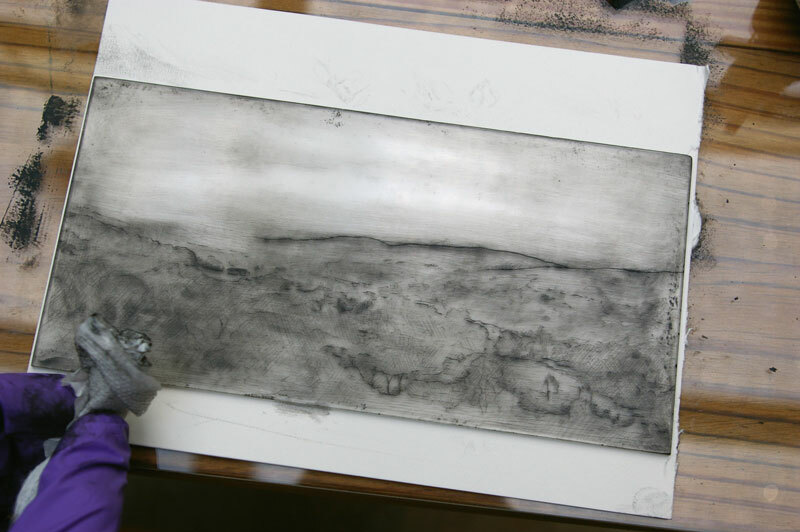 In contrast to etching or engraving, that partly rely on chemicals to create an image, drypoint is direct. 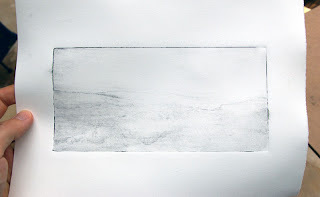 The artist scratches out the image directly onto a plate with a sharp point. The burr created on either side of this impression holds the ink in place to print. 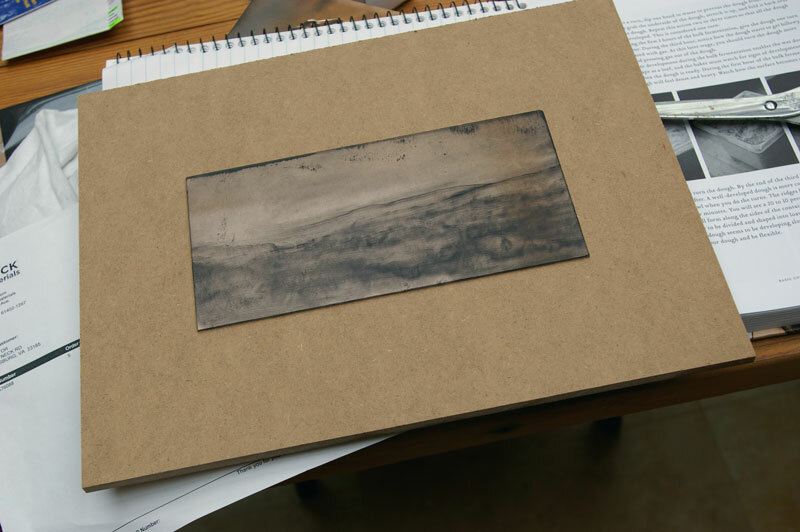 Compared to an etching, a drypoint has a warmer and richer appearance. 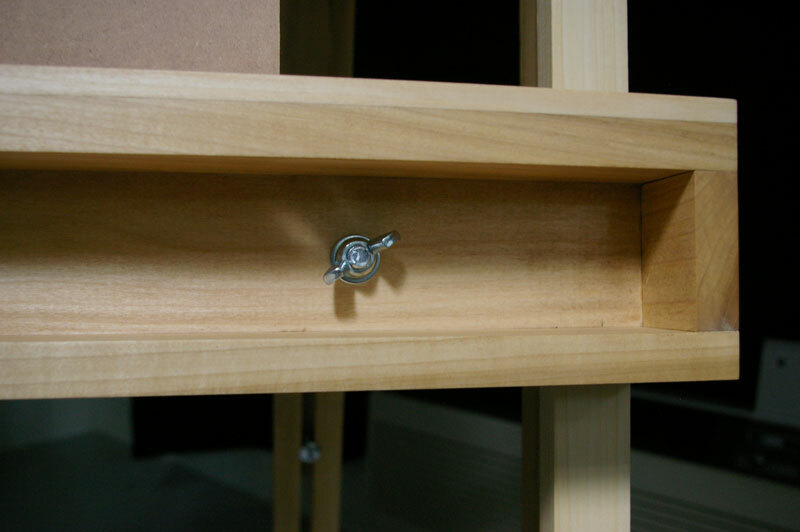 Its major drawback, is that it wears out relatively quickly. The delicate burr is worn down with every print that is made. Realistically, only about 20 impressions can be made before a drypoint is worn out. 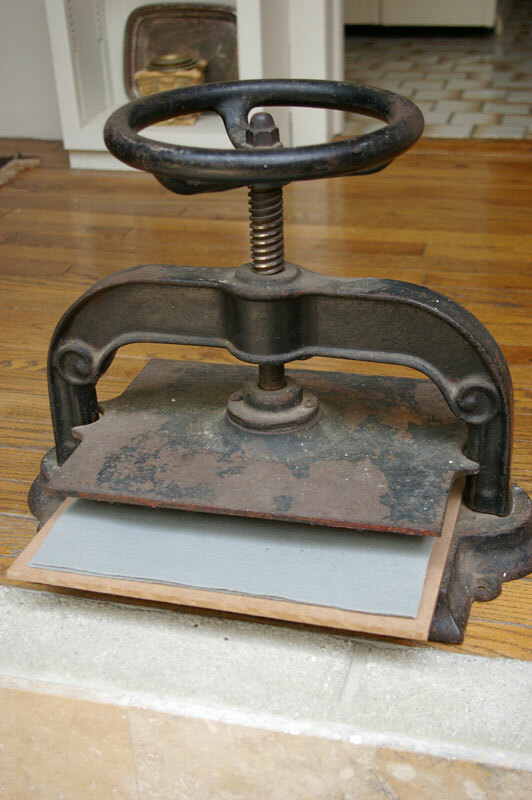 Intaglio prints require an expensive etching press. Since I don't have access to one, I considered making drypoints a dead end. To my surprise, I discovered that there is a way to print drypoints without an etching press. Websites such as this one cover the process in detail. 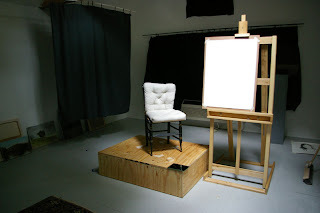 This technique will only work with drypoints, other intalgio techniques still require the fancier equipment. A metal plate is usually the basis of a drypoint print. Plastic, such as acrylic or plexiglass, can also be used. 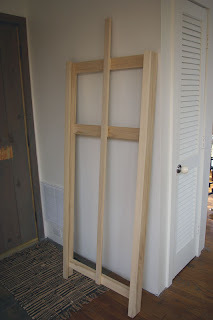 This has the advantage of being inexpensive and easy to cut. 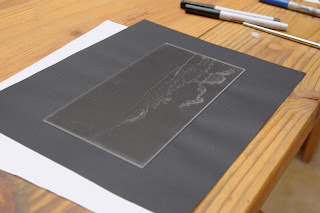 One can also see through clear plastic to a drawing on the other side. 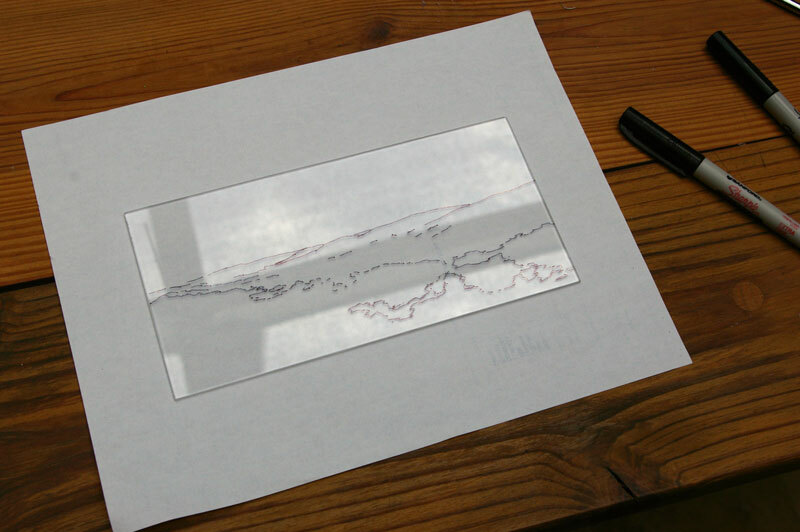 I began by drawing out a loose outline of the image onto the plastic with a pen. 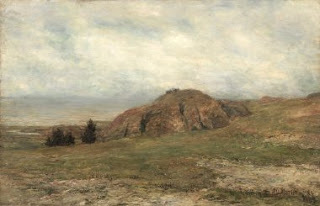 The image will be a long-valley landscape scene. After this was established, I began inscribing the lines into the acrylic with my drypoint needle. The black paper backdrop allows me to better see the work. Once all of the lines are inscribed, the plate can be inked. The object to the top left is a dabber, for applying ink. I applied a large amount of ink, until the plate is completely covered. The excess ink is wiped off of the plate using gauze, and torn phonebook pages. By wiping the image more or less, the final appearance can be tweaked. I took care to select what areas I wanted to highlight in the image. The paper is dampened before it is printed. It was soaked in a tub of water for fifteen minutes. 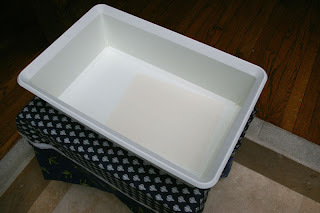 The paper is then removed from the tub and placed in a towel to soak up excess water. I used this old book press to make my print. 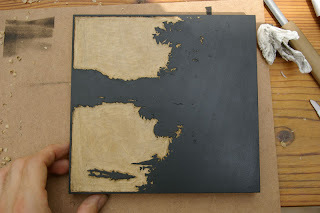 The plate is placed ink side up on a piece of mdf. The paper is then positioned on top. 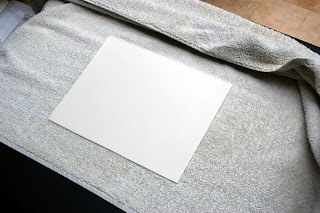 A few sheets of felt are added over top the paper, and act as a cushion in the press. The print is finally ready to go in. I was a bit disappointed to see how weak the final image came out. I haven't given up on this technique completely. With some experimentation, I hope to get some better results. A recent work in progress, this was my first big project on gessoed oak panel. I braved the sauna-like July weather, and ventured out to a brand new location. 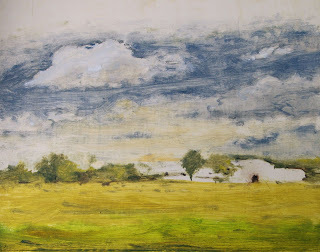 For this painting, I'm still relying on my full palette of hand-made pigments. This picture started off with a lot of promise. Then I started having a series of "off" days, and the picture suffered as a result. Especially in the foreground. I'm going to set this one aside for awhile and return to it. I've made some additional changes to my studio, to make it better and more flexible. 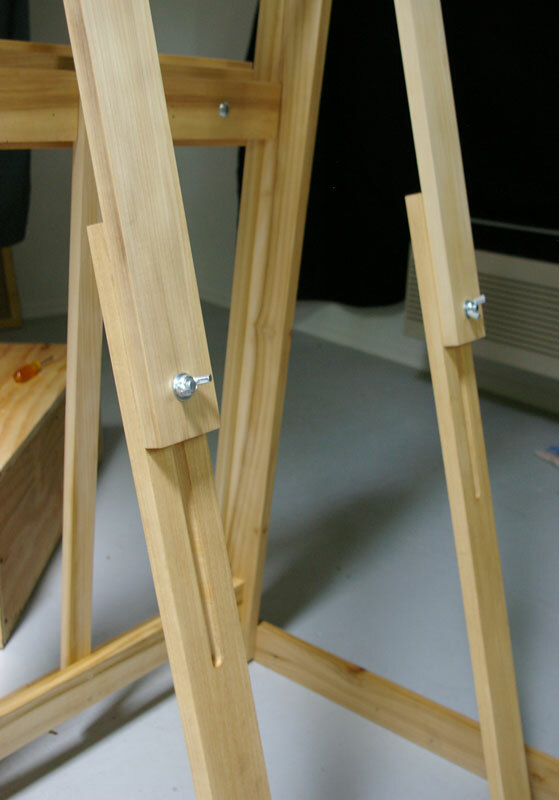 Making a new easel was just the first step. 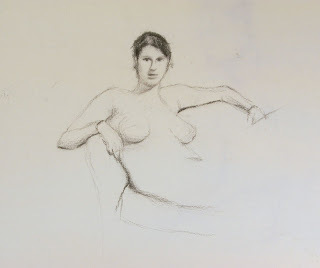 Ever since I moved into the studio, I've wanted to return to doing portraits and working from live models. To be able to handle portraits, I needed a way to sit a model at eye level. 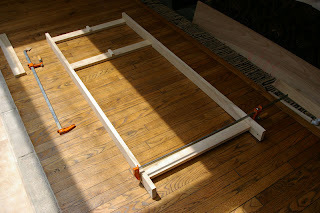 The plywood platform that I built can be seen in the photo. This raises a seated model just up to the right level so that I'm not looking down on them as I stand and work. 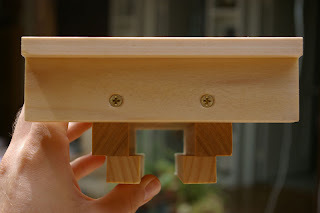 The platform has a box-frame on the inside to support the weight of the model sitting on it. At some point, I will paint the platform so that it doesn't stick out so badly. 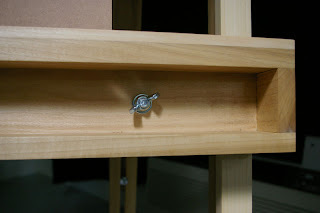 To the rear you can see a curtain rod I put in to sit behind the model. This hangs from a rafter on the roof, and it can be moved around and adjusted. The curtain can also be taken off and changed so that I can adjust the color of the background. I've tried out the current setup a few times and are really happy with it. I was pleasantly surprised to find a brand new book on Tonalism at my local library the other day. I am a bit of a fan of this style of artwork. While I was looking over this book, I was struck by something I had thought about before, why is it that some artists are households names, while others fade into obscurity? In the case of the great masters, their fame is obvious: the genius of their work is easily observed by most people. There are some cases where an old master is lost or falls out of fashion. 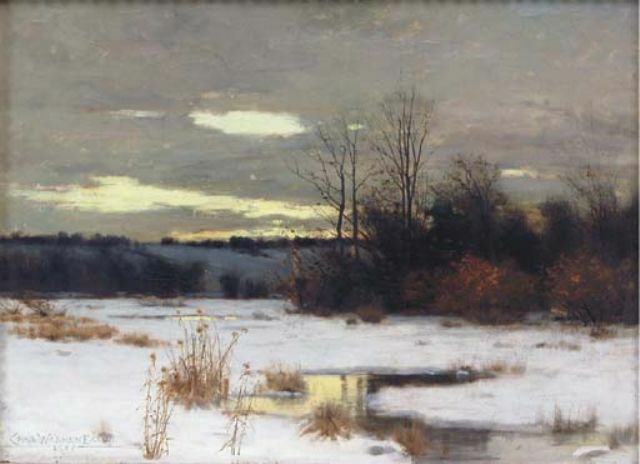 If an artist’s work has merit, they tend to be rediscovered at some point, even if it takes hundreds of years. These are not the kinds of artists I am thinking of. The obscure artist tends to be unknown even to many art lovers, relegated to a mere footnote in some book. Their paintings are probably in the catalogs of small regional museums, lacking the clout to draw in the “big names” of art. Fans who visit these museums may discover that they are in storage and not on display. 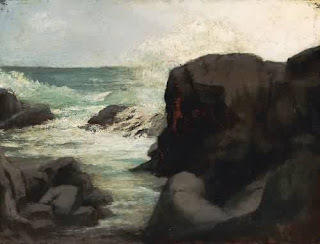 Obscure or unfashionable work is commonly sold off, often for firesale prices.